SKU: JFX001. Category: Biome Series by John Fox. I was walking through my local park when I stepped over this leaf. The moment I had it in my hand I knew I had something special. I immediately realized the potential I was holding, and I could visualise how I was going to capture this image photographically. I then had to walk two kilometres with this delicate treasure protected in my hands from wind, weather and dogs. I raced home to capture the shot which instantly met and exceeded my hopes. 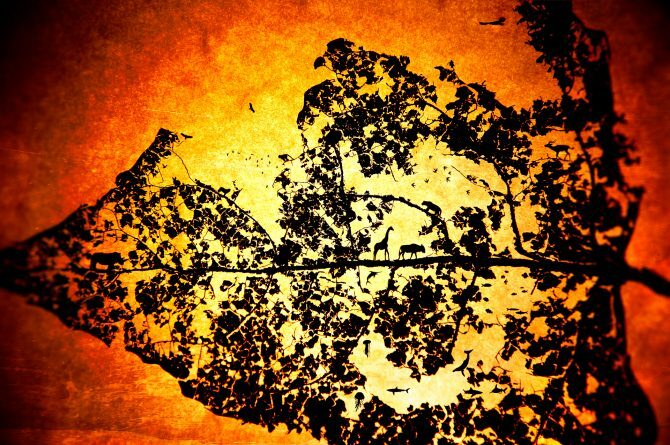 While processing the image I noticed in the broken silhouette of the leaf structure the form of a man battling against the wind on his way home. This is an image from my childhood from a much prized book of Aesop?s Fables which is filled with beautiful illustrations. When I saw his shaped emerge I wondered how many other hidden silhouettes there were. It was such a fun and exciting discovery I decided to populate the picture with more hidden gems. I put birds in the sky and fish in a sea, and filled the world with all manner of creatures. I packed it with every silhouette I could get my hands on to represent the diversity of life. And so the series began.